Living Area 1050 Sq. 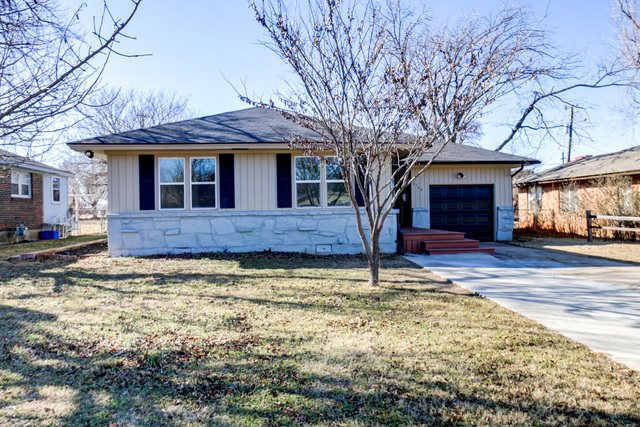 ft.
You will want to check out this great remodel in Mayfair Heights! The modern interior will have you wanting to move in asap! Open floor plan with living, dining and kitchen all open to each other. The kitchen has all new custom modern cabinets, quartz counter tops, tile back splash, appliances and tile floor. The master suite is jaw dropping! The master bathroom is complete with modern floating vanity, wet room with shower and tub, and custom closet. There is great natural sunlight throughout the house with new double pane windows. Hardwood floors have been refinished through out the house. The one car garage is attached with washer and dryer. There are two great decks, one in the front porch and also one in the backyard. Both decks are composite, so they should withstand the Oklahoma weather. The backyard also has two outbuildings. The larger outbuilding can be a second garage or workshop. The back fence also has a back gate entrance for easy access to the workshop.